In its neuroprotective role, the blood-brain-barrier (BBB) blocks agents from entering the brain. This protective mechanism has been in place since man first walked the earth. If this mechanism was not in place, the brain would self-destruct within a few weeks, as invaders, including natural sugars, foods, and amino acids, would cause a biochemical implosion capable of killing the host (the human body). Getting helpful and therapeutic agents to cross the BBB without allowing dangerous agents access to the delicate brain-balance is a very intricate process involving many years of specialized research, including extensive trial-and-error methods. The key in Nanoengineering is to biochemically attach a therapeutic agent combined with a nanoparticle in order to access one of the four pathways. A nano-sized agent is small enough to cross the blood-brain-barrier, as long as it is a “brain-friendly” agent. Plant glycosides can be engineered to cross the blood-brain-barrier attached to a therapeutic agent, such as the amino acid L-arginine. Currently, the only known and proven technology for glycoside engineering that encompasses Nanotechnology is Trutina Dulcem, a 32-step process involving the removal of glycosides from organic kiwi fruit. Since a nanoparticle is incredibly small, a delicate proprietary extraction process is required to produce glycosides that can attach to an amino acid molecule, and transport it safely over the blood-brain-barrier. 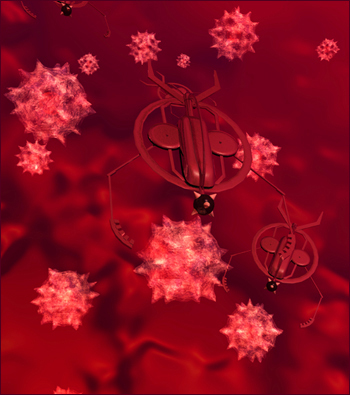 Nanoparticles possess a diameter small enough to penetrate through diminutive capillaries into the cell's internal machinery (3) and create a pre-programmed response, thus the term Edible Computer Chip. Once within the body they are highly mobile, and in some instances, can be engineered to cross the blood-brain barrier (BBB). The blood-brain barrier (BBB, also known as the blood-cerebrospinal fluid barrier) is a membrane that controls the passage of substances from the blood into the central nervous system. The BBB is a physical barrier between the local blood vessels and most parts of the central nervous system itself, and stops many substances from traveling across it (2). Throughout the body, the walls of the capillaries (the smallest of the blood vessels) are made up of endothelial cells separated by small gaps. These gaps allow soluble chemicals within tissues to pass into the blood stream, where they can be carried throughout the body, and subsequently pass out of the blood into different tissues. In the brain, these endothelial cells are packed more tightly together, due to the existence of zonulae occludentes (tight junctions) between them, blocking the passage of most molecules (2). The blood-brain barrier blocks all molecules except those that cross cell membranes by means of lipid solubility (such as oxygen, carbon dioxide, ethanol, and steroid hormones) and those that are allowed in by specific transport systems (such as some amino acids). Only a Specific Transport System will allow the amino acid L-arginine to cross the blood-brain-barrier. Carrier-mediated transporters, such as the amino acid carrier Trutina Dulcem, is an Nanoparticle biostrategy designed to allow transport across the blood-brain-barrier. Other methodologies for BBB transport include receptor-mediated transcytosis for insulin or transferrin; and blocking of active efflux transporters such as p-glycoprotein. With new methodologies heretofore unavailable to scientists, Nanoparticles will now take their respective place in the medical and science fields, particularly in the field of chemotherapy drug delivery. Strategies for drug delivery behind the BBB include intracerebral implantation and convection-enhanced distribution. Substances with a molecular weight higher than 500 daltons (AMUs) generally cannot cross the blood-brain barrier, while smaller molecules often can, thus elucidating the complexity of creating a Nanoparticle that can cross the BBB. Many drugs are unable to pass the barrier, since 98 percent of them are heavier than 500 daltons. In addition, the endothelial cells metabolize certain molecules to prevent their entry into the central nervous system; the most-studied example of this is L-DOPA (2). The blood-brain barrier protects the brain from the many chemicals flowing around the body. Many bodily functions are controlled by hormones, which are detected by receptors on the plasma membranes of targeted cells throughout the body. The secretion of many hormones are controlled by the brain, but these hormones generally do not penetrate the brain from the blood, so in order to control the rate of hormone secretion effectively, there are specialized sites where neurons can "sample" the composition of the circulating blood. At these sites, the blood-brain barrier is 'leaky'; these sites include three important 'circumventricular organs', the subfornical organ, the area postrema and the organum vasculosum of the lamina terminalis (OVLT) (2). The blood-brain barrier (BBB) is an effective way to protect the brain from common infections and invaders that cause brain-imbalances, such as L-Lysine blocking L-Arginine from crossing the BBB. If the wrong agents are allowed to cross the BBB, or to piggy-back on agents that cross the BBB, serious brain infections can occur, which are very difficult to treat or cure. As such, it is imperative that therapeutic agents, whether amino acids or drugs, are Nanoengineered to cross the blood-brain-barrier unobstructed, and without carrying dangerous agents into the brain. In its neuroprotective role, the blood-brain barrier functions to hinder the delivery of many potentially important diagnostic and therapeutic agents to the brain. Therapeutic molecules and genes that might otherwise be effective in diagnosis and therapy do not cross the BBB in adequate amounts. Mechanisms for drug targeting in the brain involve going either "through" or "behind" the BBB. Modalities for drug delivery through the BBB entail disruption of the BBB by osmotic means, biochemically by the use of vasoactive substances such as bradykinin, or even by localized exposure to ultrasound. The potential for using BBB opening to target specific agents to brain tumors has just begun to be explored (2).